For a recap of 2014 see here. For a recap of 2012 see here. 2015 was certainly interesting from a meteorological standpoint. In time we will remember the snow blitz of late January and February and the warmth of December. Here is my top 5 for Southern New England. Honorable mention- 90 degree weather in September, distant impacts from Hurricane Joaquin (flooding rains in late September), 49 degree weather on June 1st. One year ago here is what the drought monitor looked like for the Northeast. 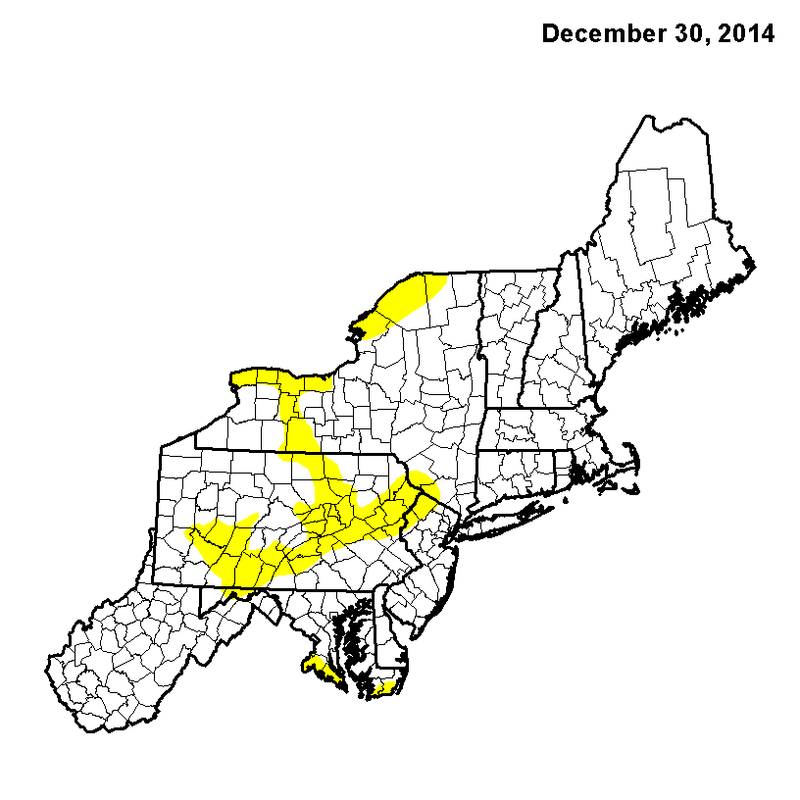 The yellow indicates abnormal dryness. One year later and one can really see the difference in Southern New England especially Connecticut. Now this has nothing on the drought in California but many of us noticed brown lawns this spring and summer. It went weeks at a time without raining. The drought peaked in May when all of Massachusetts, Rhode Island, and Connecticut were in moderate drought. 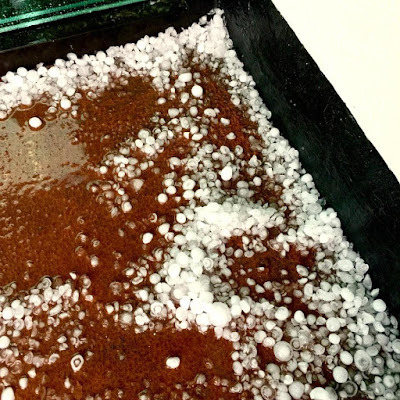 June brought some relief as rains fell on the first the month and again in the later parts of the month as the remnants of Tropical Storm Bill moved through. A few severe weather events helped drop some rain this summer. The rains of last week have helped but this is something to watch going into 2016. 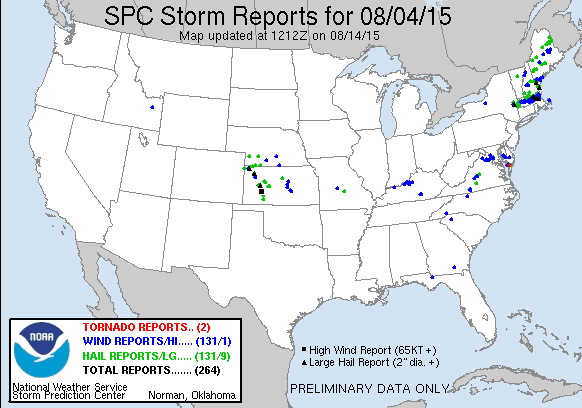 Two rounds of severe weather ripped across the region on 8/4/2015. I posted after the first round knocked out power to thousands in Rhode Island and Southeastern MA. A mid/upper level speed max moved into New England which also had very strong wind shear aloft (ie winds turning with height). As a result several supercell thunderstorms formed. These storms prompted tornado warnings in Franklin, Worcester, and Middlesex counties. These thunderstorms were not the typical storms we see in Southern New England. Hail up to 2" in diameter smashed car windows in Eastern MA. At the peak over 100,000 people lost power in Southern New England. While 2014 saw a pair of tornadoes touch down in Southern New England a case can be made that this day was the most widespread severe weather outbreak since the June 2011 event. This storm started it all. Winter 2014-15 had started slowly with some cold but little snow. After a 3-6" snowstorm the weekend of Jan 24-25 mother nature dropped the real bomb on us. This was a true New England special. Snow started to fall around 5-6 PM Monday night and did not stop until 10 PM Tuesday night. All in all Worcester ended up with 34.5" of cold fluffy snow, a new record. Personally this storm was a pleasure to cover. Of course I didn't know what was to come but the snow was so light and easy to move. To watch it pile up as fast as it did was a sight to behold. See my posts on the storm here and here and here. For the second year in a row we were able to play football outside on Christmas Day. Christmas Eve featured temperatures in the upper 60's. The final stats are not in yet but for much of the Eastern US December 2015 will go down as the warmest on record. We have already set the record for most 50 degree days and most 60 degree days in a given December. I called this Heatmiser's Revenge and tried to give some meteorological explanation for the warmth. Some trees even started to bud! 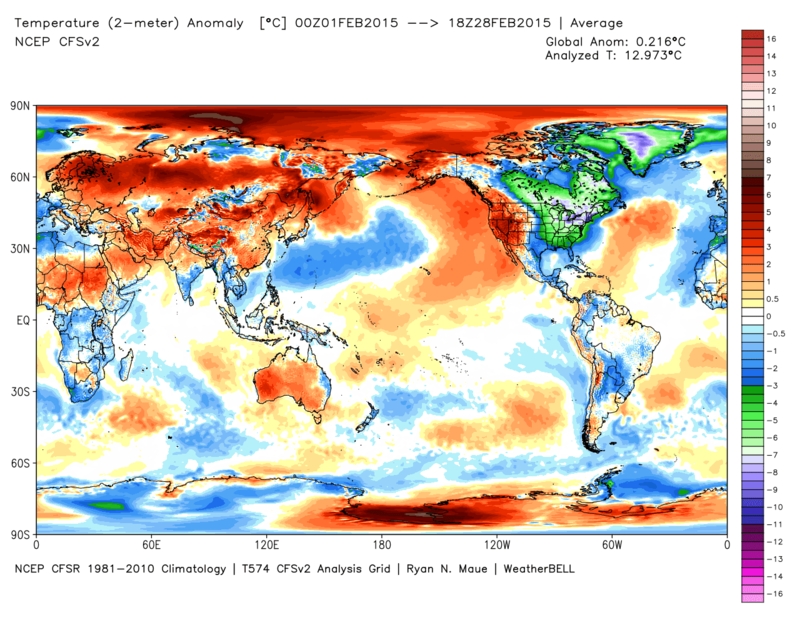 In some respects it is similar to the March 2012 warmth. That warmth was more impressive because we hit 80 degrees multiple times that month. But still this was impressive by any measure. I have to rank it ahead of the blizzard because weather wise this is more rare. At the same time bone chilling cold invaded New England and it did not leave. In fact the month became the coldest month ever in Worcester and Hartford and the second coldest month in Providence and Boston. Boston went 43 straight days without topping 40 degrees. A third storm hit Feb 8-9 with over a foot of snow. Then a second blizzard hit on Valentine's Day! I don't want to crash your browser with anymore pictures and videos so please see my post from Feb 12 here. I also urge you to read these stats from the USA Today weather team about the winter. Have a safe and happy New Year everyone. Together we will see what mother nature has for us in 2016! The National Weather Service in Taunton has issued a Winter Weather Advisory for much of Southern New England. A quick burst of snow will quickly give way to sleet and freezing rain before changing over to plain rain later Tuesday. The initial burst of snow and the ice will contribute to a difficult AM commute tomorrow. One silver lining is that many people are off this week so the roads will not be as congested as usual. The storm system responsible for the devastating twisters this weekend and the strong snows is on the move. At the same time our first real cold high pressure of the season is sending cold air into New England. The easterly motion of the high will help lock in the cold air. At the same time the north northeast motion of the low will help warmer air surge north. The initial meeting of these air masses should cause snow to break out tonight. The first precipitation reaches Western New England between 12-1 AM while it gets to Worcester, Hartford, Boston, and Manchester between 2-3 AM. 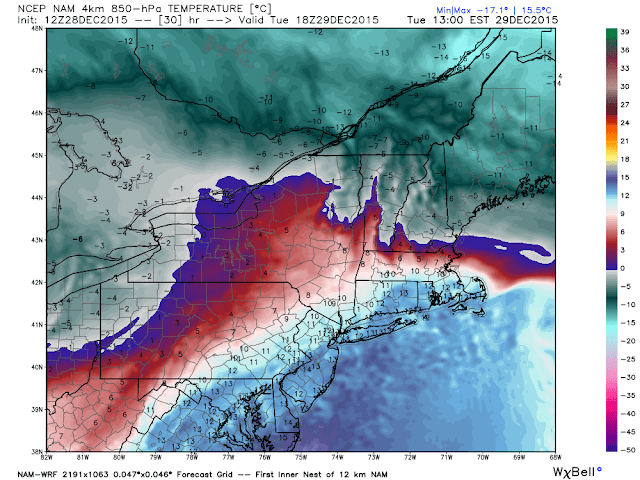 Surface temperatures at this time project to the upper 20's in Central/Western MA and Northern CT and 30's SE MA, RI, CT.
As the low surges towards the Great Lakes and the High dives east the warmth will want to overtake the cold. However given the density of cold air the warmer air will be forced up and over this layer. This will transition to snow over to sleet and freezing rain. 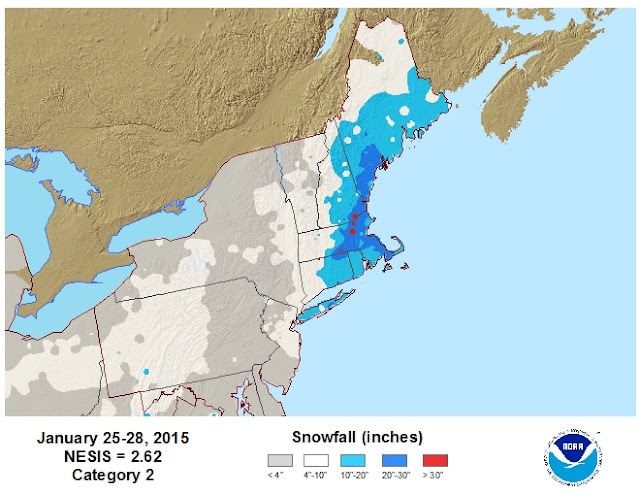 I actually think this map is overdoing the snow in Massachusetts. I expect sleet and ice to be taking over around 6-7 AM. 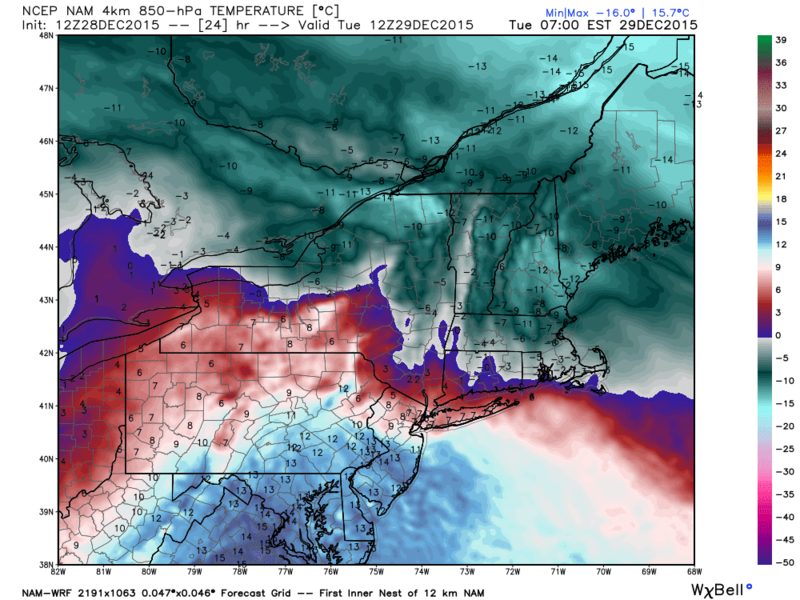 Surface temps at 7 AM are right at freezing or just below for interior MA. Notice mid to upper 30's in coastal areas. It should be flipping to rain in these areas but the roads will still be slippery from the first burst of frozen precip. Temperatures at 5000 ft will be cool, but up at 10000 ft the warm air will be melting the snow layer for Southern New England. 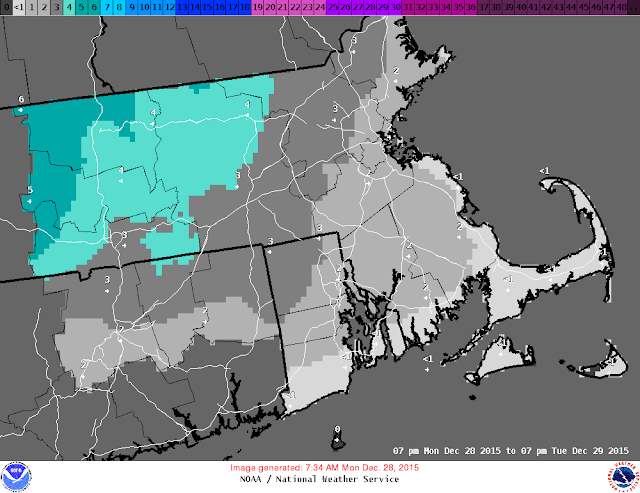 Northern New England should still be snowing tomorrow AM. By 1 PM the warm air have won out. A secondary low pressure will form and track just offshore Cape Cod. In general snow amounts will be light and most will wash away in Southeastern New England. Here is the National Weather Service most likely snow totals. Looks like 1-3 inside 495 and south of the pike with 3-6 north and west. 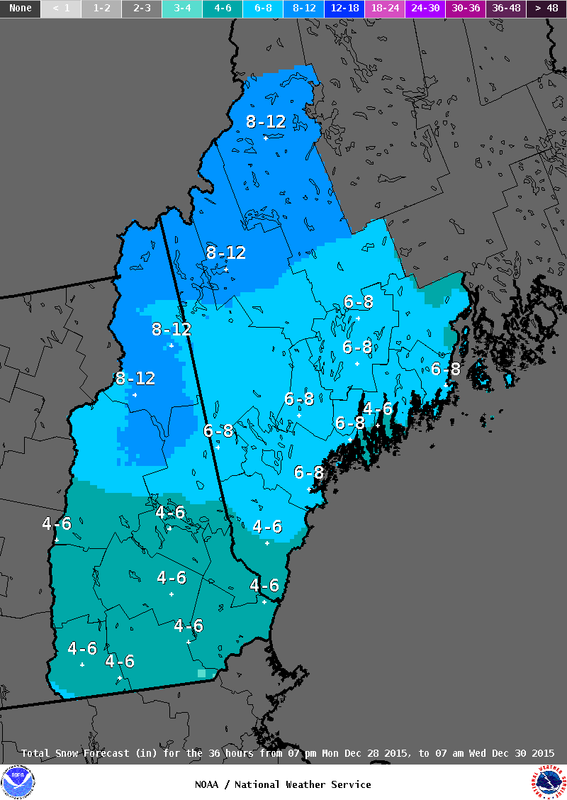 Totals are higher in Northern New England. It doesn't take much ice to cause a mess. Some areas of Western MA and Southern VT are likely to see almost 0.25" which is enough to take down branches and power lines. WPC Tuesday ice probabilities at least .25"
All in all the storm will be a typical early winter slop storm. Another shot of rain is likely Wednesday night into Thursday. 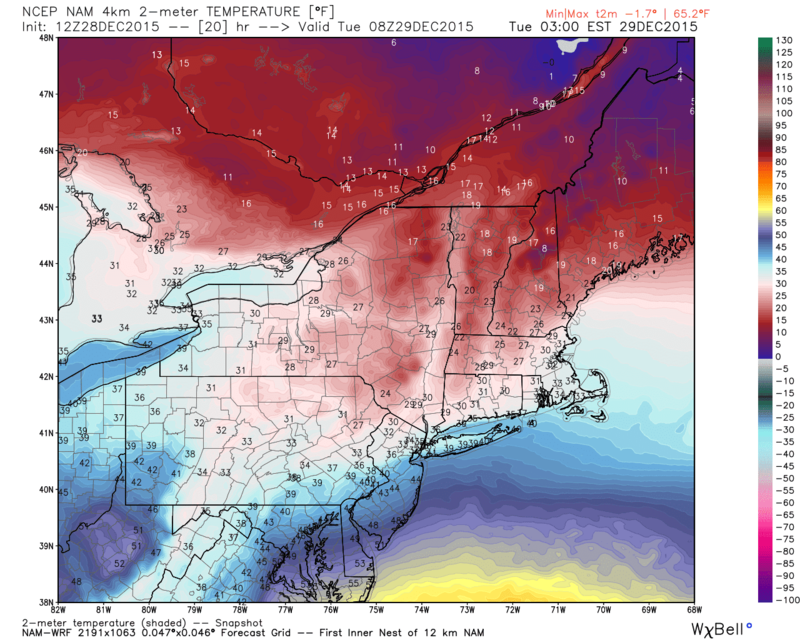 Temperatures for the winter classic look to be in the upper 30's on Friday. If anything major changes I'll update but that's all for now. 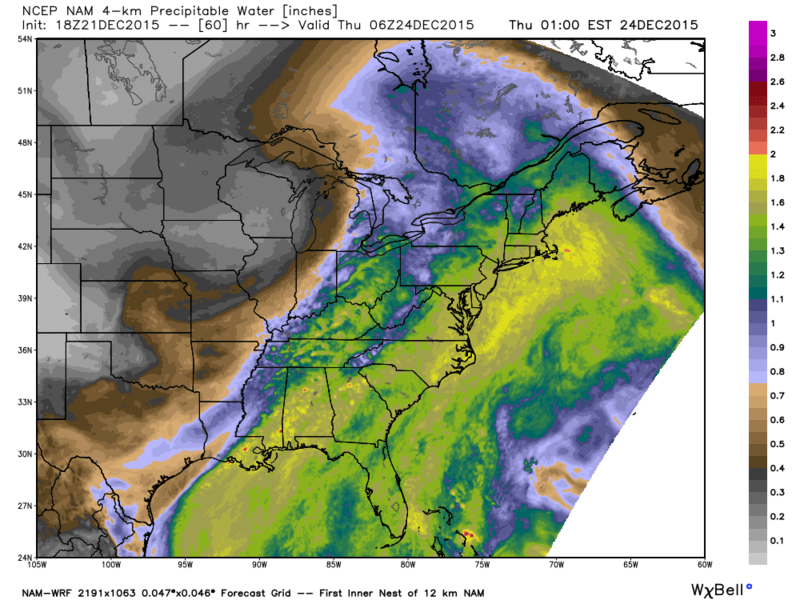 A dynamic December storm is impacting the South Central US. Tornadoes ripped through Texas last night killing at least 11 people. At the same time a blizzard is raging in North Texas, New Mexico and Western Oklahoma. Eastern Oklahoma and further east into the Midwest is under flood watches and warnings. This storm is heading to the Northeast and will impact the Tuesday morning commute. The 1 PM surface forecast chart from the Weather Prediction Center shows the storm system and its myriad of hazards. A few showers is likely today as low pressure moves along the frontal boundary. The cold front will push offshore tonight. In its a wake a strong area of high pressure will descend into the Great Lakes. 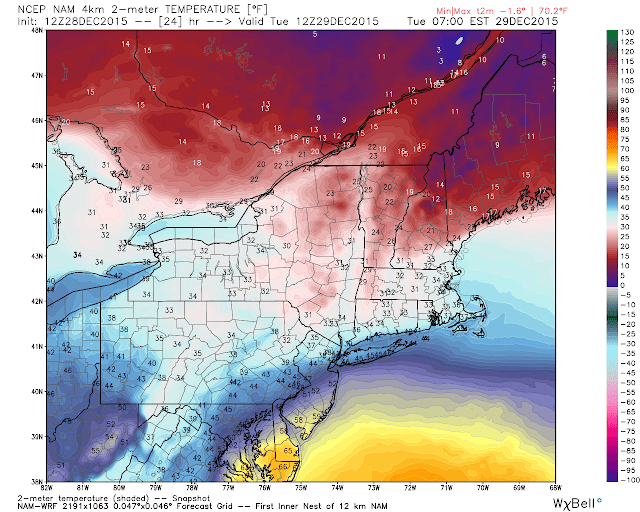 Monday will feature seasonable temperatures in the 30's. Given the warmth of December so far this will probably feel colder than it is. Overnight temperatures will drop into the 20's. This helps the set the table for snow to start just after midnight from Southwest to Northeast. The main low cuts into the Western Lakes. A new low should form along the coast. A warm front will try to push north but it will be blunted initially by the cold air in place. This will allow for a thump of snow at the onset. 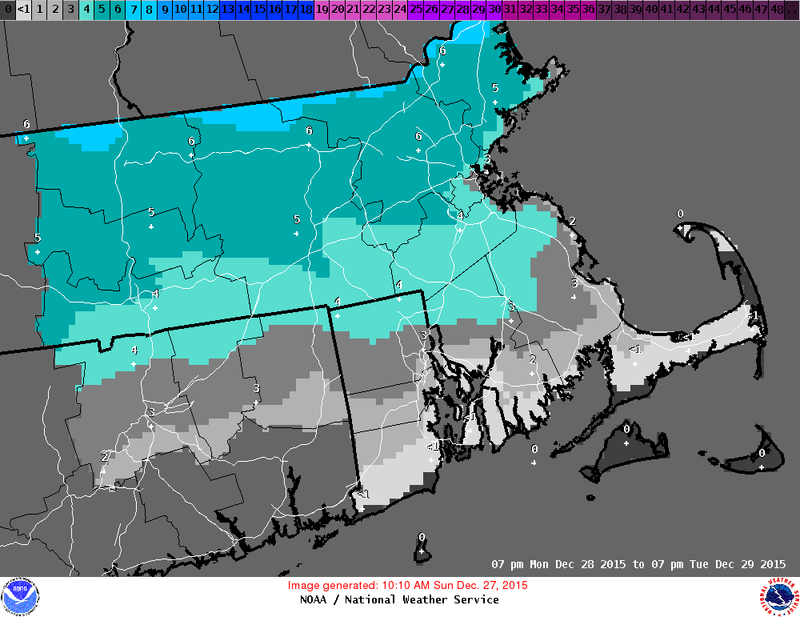 It looks like 4-6" north of pike, 2-4" from Hartford to Providence north to the Pike, and 0-2" areas south of that. Northern New England looks like they will do well with upwards of a foot. 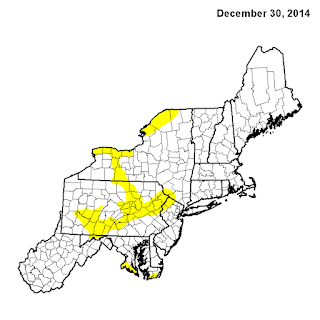 A period of ice is possible in Western MA. Sleet and then plain rain is more likely in Southeastern New England. The evening commute is OK as any lingering precipitation is rain. 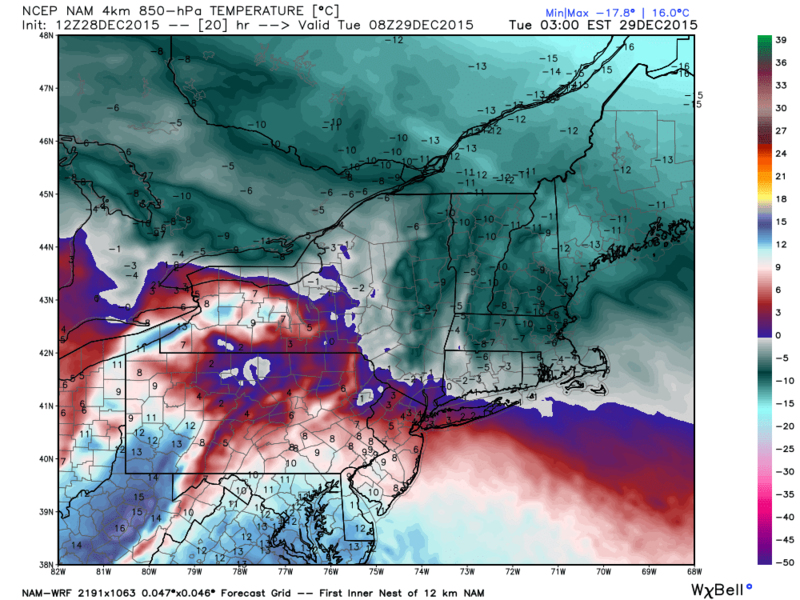 Record Warmth for Christmas Eve? While some may be dreaming of a White Christmas it is not in the cards for much of the Eastern United States this year (see Heatmiser's revenge). An active weather pattern will lead to showers at times and the potential for record high temperatures on Christmas Eve. 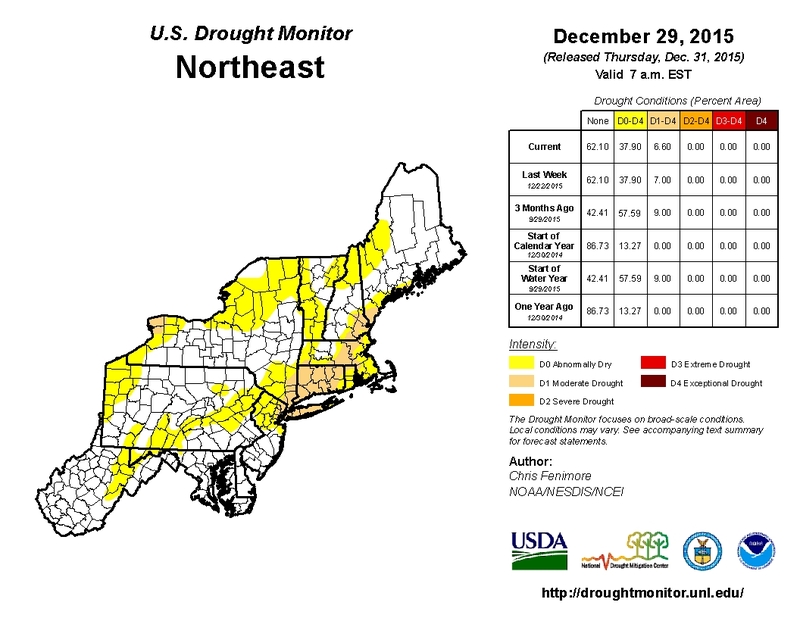 The rain showers are good as it is still very dry in Southern New England. 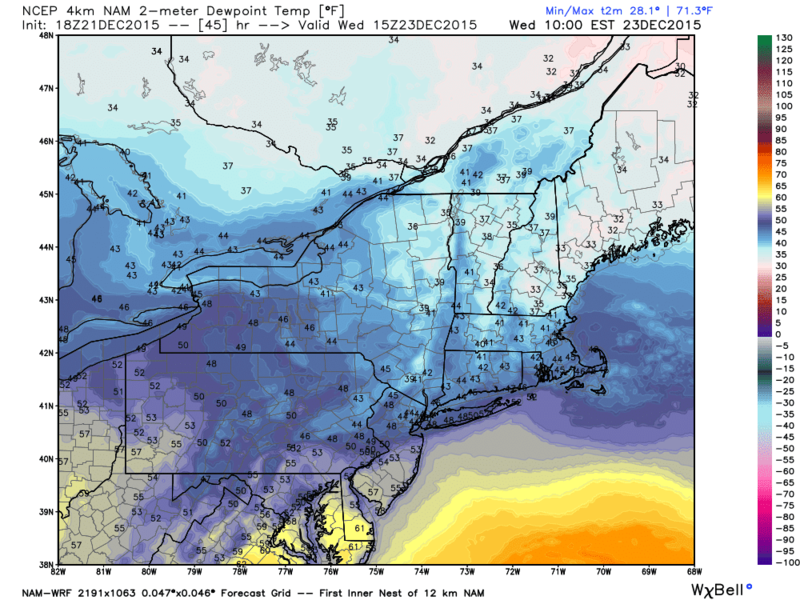 Christmas day looks to be mild and dry.. The 4 PM surface analysis shows southwest flow in New England with tropical origins. Upper level flow goes more to the west Wednesday morning so we are looking at a chilly start. Temperatures will likely be in the low 40's around 10 AM. With the potential for some showers this may feel pretty miserable. In English this means temperatures in Southern New England on Christmas Eve will be in the mid to upper 60s and as NWS Boston points out with any sunshine somewhere could hit 70. The limited daylight makes this a tall order but it could happen between 1-3 PM. Total precipitation in the next 3 days is 1-3" across the region. Based off the current National Weather Service forecast for Thursday nearly the entire region will set new record highs. Via Dr. Ryan Maue who runs the weatherbell models records are based on long-period stations from the Threaded Extremes historical station time series Dataset . Forecasts are to nearest degree to account for rounding and ties. I expect mid to upper 50's on Christmas Day. That's all for now- Merry Christmas I will post some 2015 review items over the next 10 days. 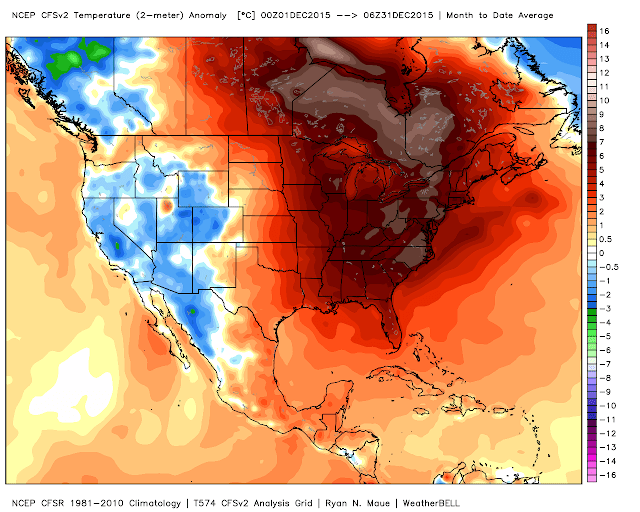 Meteorological winter began on December 1st but thus far mother nature has not gotten the memo in the Eastern US. Temperatures fell to average this weekend but they will rebound to near record warmth for Christmas Eve. So in the words of Vince Lombardi...what the hell is going on out there? 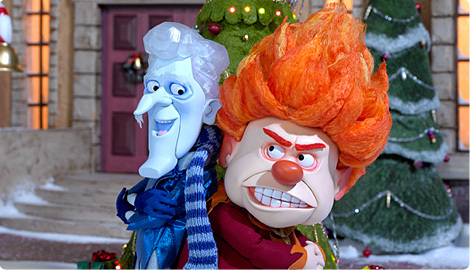 It could be Heatmiser's revenge for this past January and February. Rumor has it he is very mad at his brother Snowmiser for the stunt he pulled on Southern New England last winter. Just as she did in "The Year Without A Santa Claus" Mother Nature may have stepped in to mediate the fight. She is allowing for some nice spring weather in December for the northeast. 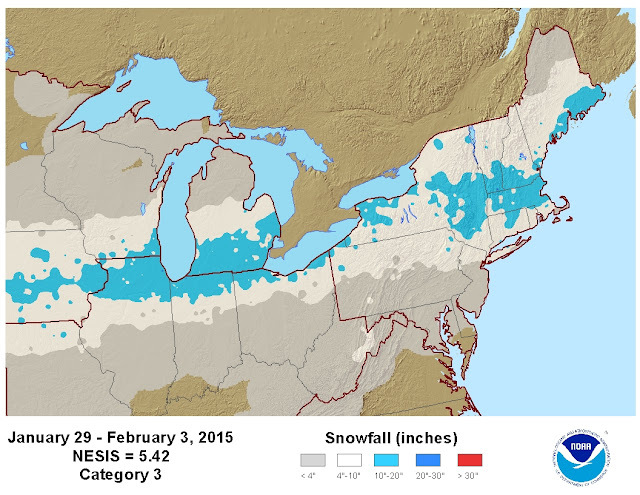 Another theory is that this is simply a boring weather pattern for winter weather lovers. As you must have heard by now the Pacific Ocean is experiencing an El Nino. This is among the strongest on record in certain regions of the Pacific. The Pacific Ocean is really the key player in all global weather patterns. The Pacific is larger than all of the world's landmasses combined and it has about 46% of the hydrosphere. So far we have seen a consistent ridge of high pressure in the Northeast Pacific. That in turn has led to a trough in the Western United States. That is where the snow is. That has left a constant ridge in the east. Using paint I have highlighted the ridges in red, the trough in blue. This type of configuration means the source of our air mass is from the tropical Pacific Ocean. There is no snow cover in the Midwest so this air mass is not being moderated either. As a result we are seeing a potentially record warm December. Some of these western troughs will try to move east and they will for a few days. There is nothing to keep them in place however. The polar jet stream is staying tucked away to the north. This happened in 2011-12 as well and it never came south. The Pacific in 2011-12 could not have been more different however. Now remember- even though this was a La Nina and Pacific water was cooler than average it is still mild tropical air. Last year our source region was the Arctic and Siberia. Water just doesn't heat and cool like the land does. A permanent ridge over the NE Pac and Western North America allowed for a deep trough to stay in the Eastern US. This blocked the Pacific warmth so our source region was from the Arctic and Siberia. The tropical jet was able to stay active and met up with the polar jet off the East Coast. The Gulf Stream was able to blow up storm after storm. This isn't a pattern we are likely to see again. For snow this winter we need to see several things. 1. Need a negative Sea Surface Temperature Anomlay to develop north of Hawaii. This will prevent the Pacific ridge from being too far west. A trough further west means the Western US gets a trough and cold and snow. The East stays warm. 2. The El Nino needs to weaken and back further west. This will really energize the subtropical jet stream. If the trough is indeed in the east this sets the stages for Nor'Easters. 3. Keep the cold pool in the North Atlantic. This tends to help with blocking which allows for the polar and subtropical jet to phase off the east coast. Of these 3 factors the first one is least likely to happen. The big storm in the Bering Sea this past weekend will help but it may not be enough. 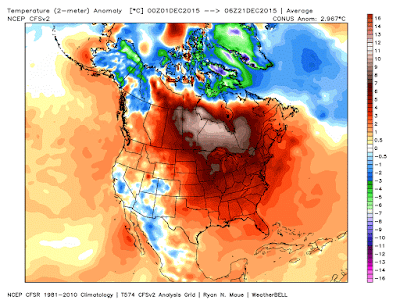 El Nino's generally peak in December so that is good for snow lovers. It may not be far enough west however. I am not convinced the pattern will flip until the middle of January. However there have been encouraging signs for those who depend on winter weather for income. I'll keep an eye on it. In the meantime I will be posting my top 5 Southern New England weather events of 2015 over the next 2 weeks. Enjoy the warm Christmas.